I first showed you this wreath when I shared my living room Christmas decorations. I needed to make something for the center shutter and I wasn't sure what. I debated over a couple things then decided that I wanted to make a new wreath. I had left over burlap from the runner I made and also bought some light brown burlap when I bought the other stuff, so I thought this would be the perfect time to use it! I started by cutting the burlap into strips. Then hot glued one end to the wreath form and began to wrap. I wrapped the burlap around slightly overlapping it as I went. 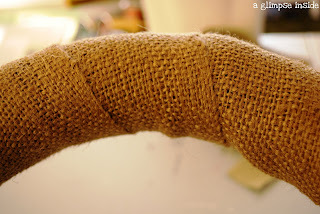 Once I wrapped the burlap in the brown, I cut a thinner strip of the the lighter burlap and then wrap that one around. I also used this one to hang my wreath. Using your yard stick, measure out a yard of ribbon and cut. Then take your ruler, and mark in 1/2in from the end. 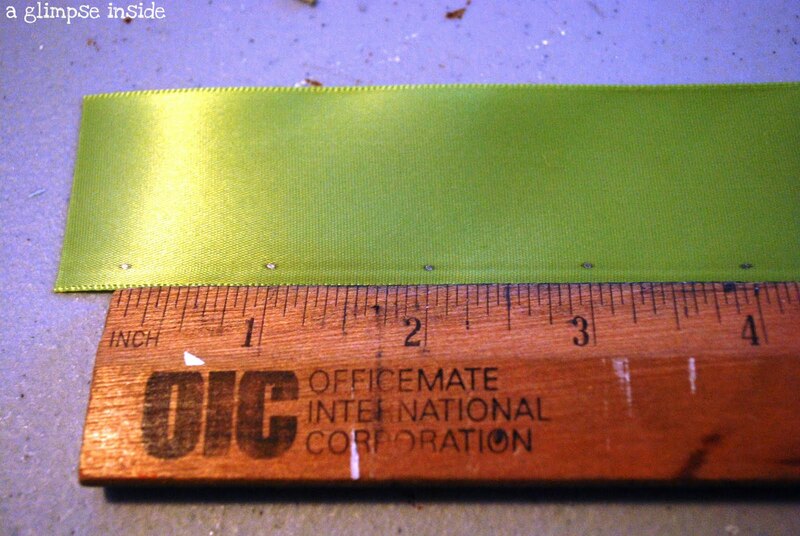 Then from that mark, mark every inch all the way down the ribbon. I didn't show it for this example medallion but before you begin to sew, take a lighter to both edges of the ribbon. 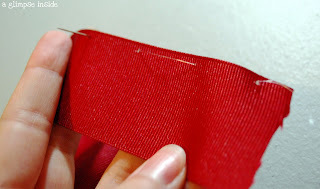 This will seal the ribbon and stop it from fraying. 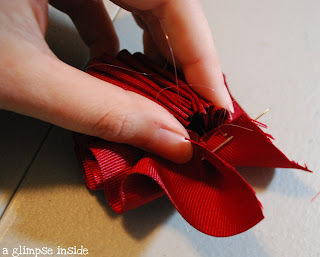 Begin by pushing the needle through the ribbon from front (the side with the marks) to back. Continue weaving the needle along the ribbon. 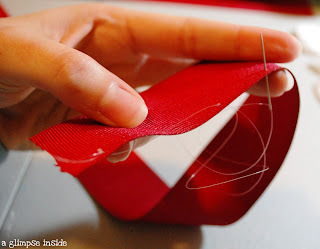 Your thread should weave from front to back, then back to front and so on. Pull your thread tight to ruffle the ribbon. Gather the ribbon and lay it flat on a hard surface. 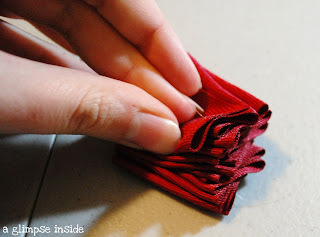 Knot your thread so it holds the ruffles in place. Let go and it should form the beginning of the medallion. 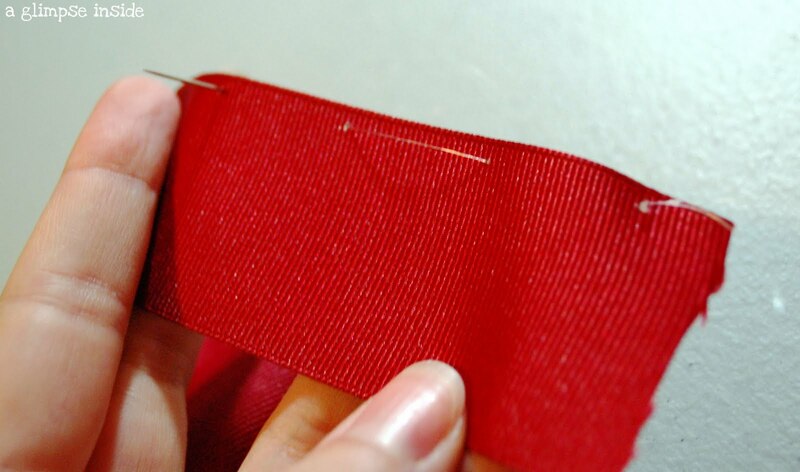 You will now have to sew your two ends together. Just separate the ruffles sew through the dots. Once you weaved your thread back and forth a couple times, knot your thread. 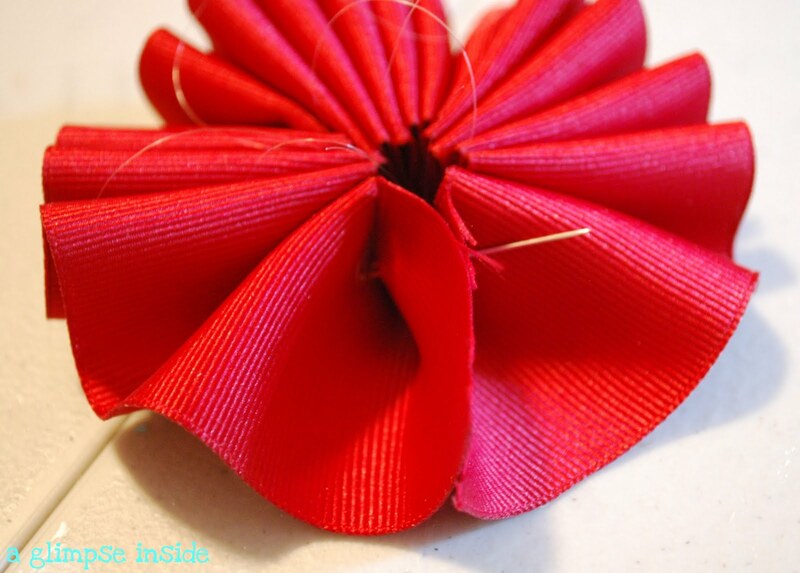 Now, push down the center of the ribbon. All of the outer edges should aim in the same direction. 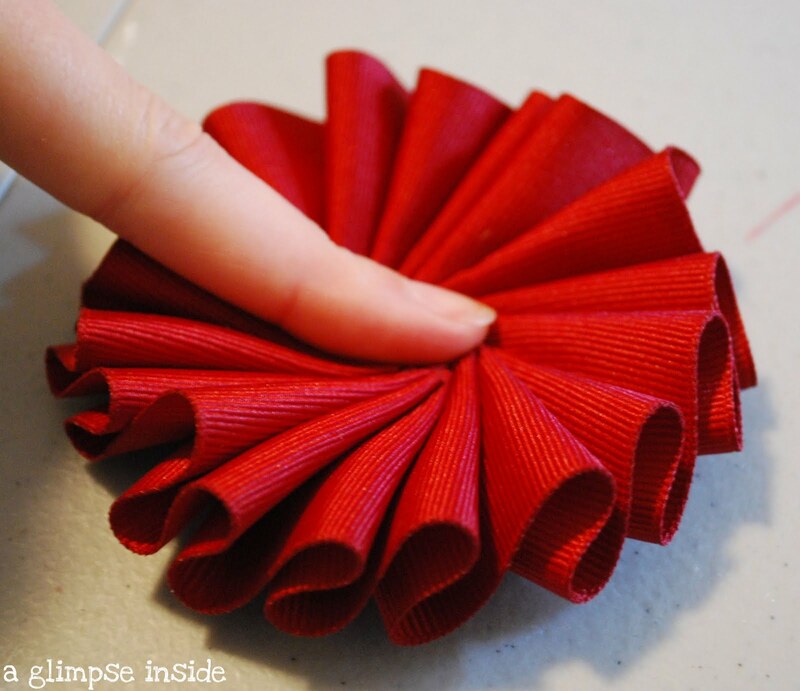 Arrange the ruffles until you are satisfied with the way they overlap. On the back side, cut out a circle with your felt and hot glue it to hold the ruffles in place. 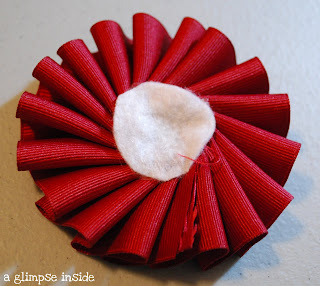 Next, flip it over and glue a decorative button onto the front. I created quite a bit in different Christmas colors. 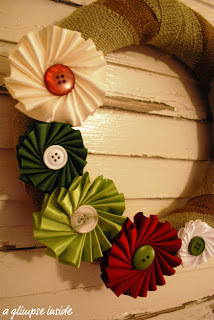 I then just arranged them how I wanted them on my wreath and glued them down. It fits perfectly on my shutter. If you make something similar to my wreath, I would love to see it! BTW I love the new Christmasy look to your blog! Oh em gee, I love it. What a great tute with amazing pictures of your medallions. I love the look of just a few of them on one side of the wreath. So extra pretty! 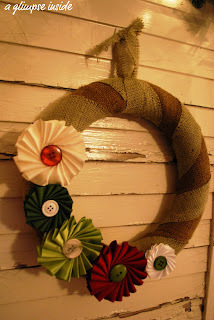 Great wreath! I like how you can change out the medallions to match the seasons too. Thanks for sharing. 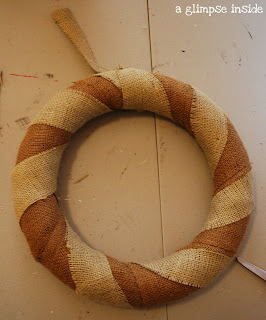 I have all the supplies on my table to make a burlap wreath...just been putting it off..so glad I did...I love the two-tone idea!! Thansk for the tips! Very cute. I have not seen flowers like that. Love them! Wow, this is super duper cute! You can never go wrong with burlap, but those medallions are darling!! Great wreath. 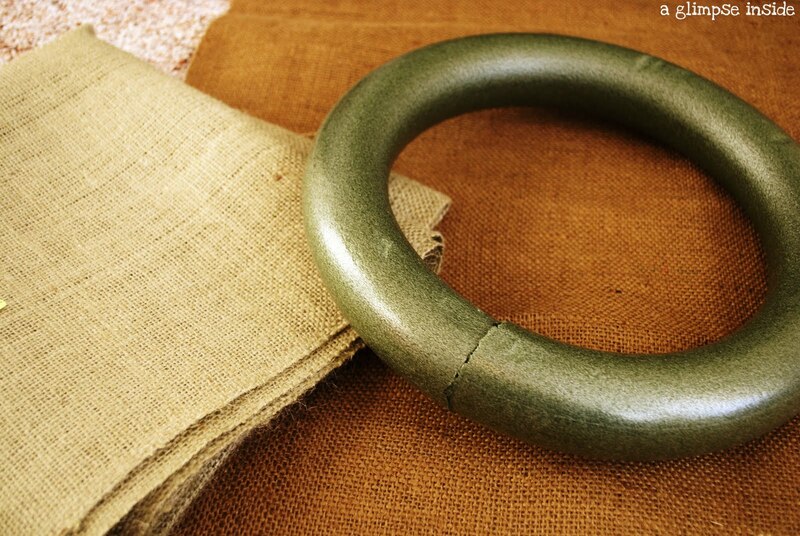 I love the two shades of burlap. Love, love the wreath. Really it could be made for any season. I'm thinking creams. Thanks for showing us how! Just gorgeous! 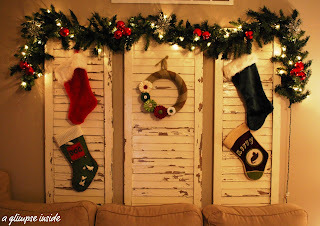 Awesome tutorial and I am in love with your shutters! Thanks for sharing at the Holiday Hookup! Found you through Take A Look Tuesday. 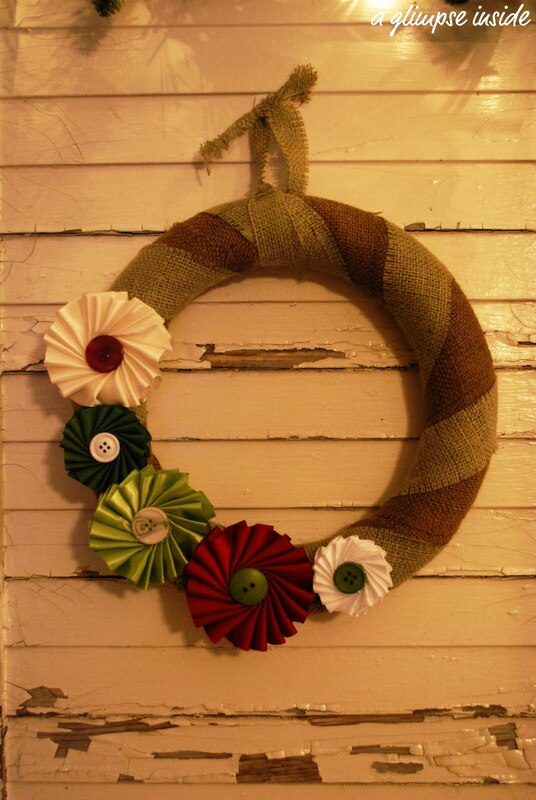 This wreath is great. The embellishments are so sweet. I'm a new follower of yours!! I LOVE those shutters! and the ribbon is gorgeous. Thos Medallions are great and so simple! Thanks for the tip. love the burlap! so cute! Hi! I am a new follower from today's blog hop. I am looking forward to reading more of your blog. 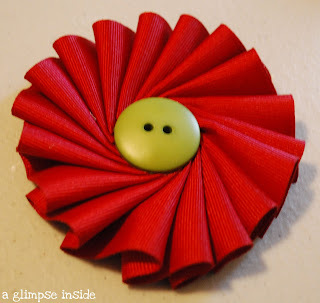 Come check out my new blog hop Thrifty Thursdays. Thanks for linking! I like the doubled-up burlap and the contrasting "neatness" of the ribbon flowers. Nice job. So cute! I'm going to try making the flowers!! Love it! Very cute! Thanks for sharing & Linking up for Craftify It Thursday! That is beautiful! I especially love your ribbon flowers! They look great! I found you from Crystal's Craft spot link party. You did an outstanding job on this one...it's so very CUTE! So, so CUTE!!!!! Thanks for sharing! I love the two different shades of burlap and the ribbon medallions are gorgeous. All together=wow! Just beautiful! 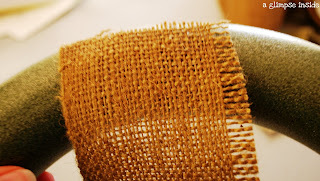 I'm really loving the simplicity of the contrasting burlap colors. 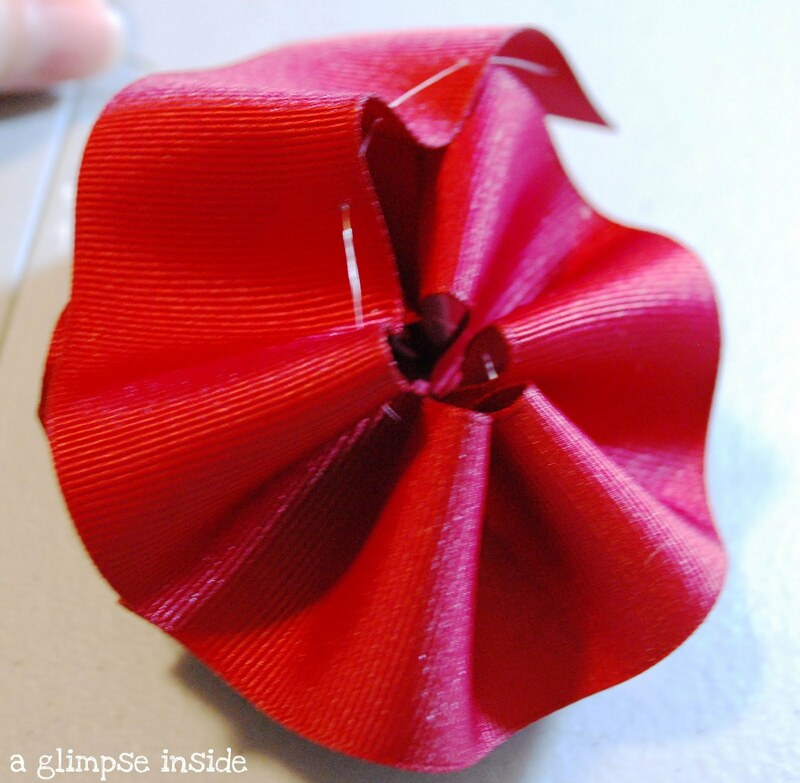 The ribbon flower give it just the right amount of pop! Great project! 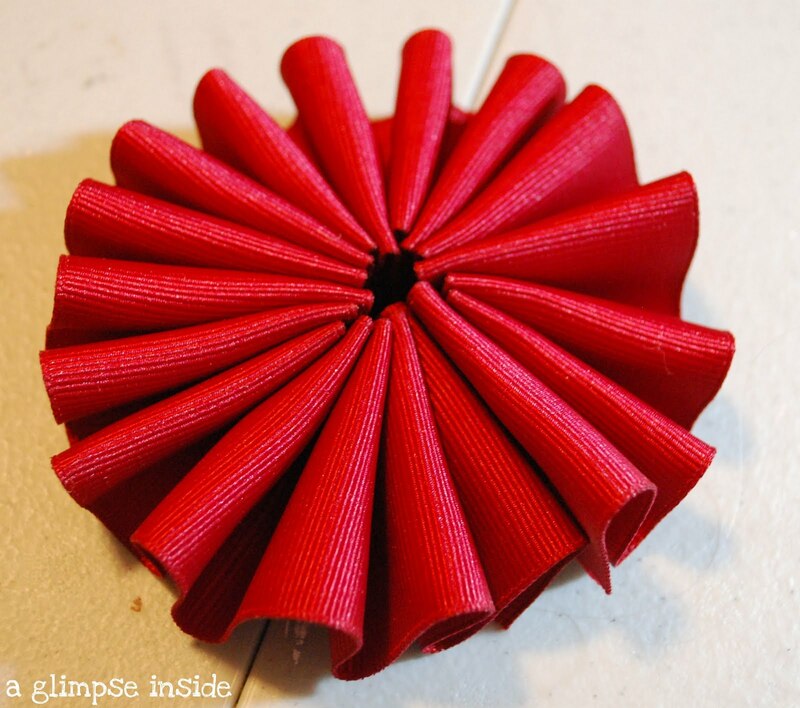 Thank you for linking up to Homemade Christmas! Oh, I love the flowers! Great idea! gorgeous wreath! and a perfect fit for those shutter! What is the purpose of the half in marks on the ribbon? Thanks!